Tungsten carbide is an alloy of tungsten and carbon; what is it about carbon that makes it the perfect metal to twin with tungsten? What is it about carbon fiber that makes it so strong? Carbon fiber consists of very thin fibers – thinner, even, than the hair on your head –made mainly from carbon atoms. Do not be mistaken by the size, however, for carbon fiber is extremely strong. Carbon atoms are bonded together parallel to the fiber; this alignment allows carbon fiber to remain lightweight while being very strong and hardwearing. It is this factor that sees it a popular material for using on sports cars – particularly in competitions such as Formula One – as well as aerospace and in the military. When stretched or bent, carbon fiber retains its strength, which makes it a standout material against others such as plastic or fiberglass. Now that you know those characteristics of carbon fiber, it might not be a surprise to find out that it can be used alongside carbon in the making of tungsten rings. A tungsten carbon fiber ring could be ideal for engagements, weddings, other special occasions, or simply as a personal accessory purchase. When used for creating jewelry, carbon fiber is protected with a non-toxic resin, which enables the piece of jewelry to withstand exposure to everyday chemicals, although harsher ones such as cleaning materials are best kept away from your jewelry, much in the same manner as with tungsten. 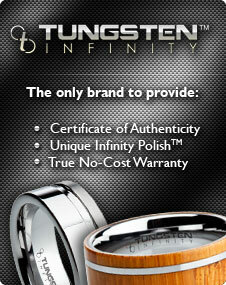 If a regular tungsten carbide is not to your tastes, then why not consider a tungsten carbon fiber ring instead?